Stella Arnaldo's Blogspot: Queen wants Adam! OK, I'm obviously still suffering from post-traumatic stress because of Adam Lambert's loss in American Idol. One bit of news that perked me up and all his fans though is Queen's Brian May saying the band was interested in getting Adam as their frontman! Wow! As you all know, Queen lost its lead singer and co-founder, the flamboyant Freddie Mercury, when he died of AIDS complications in 1991. 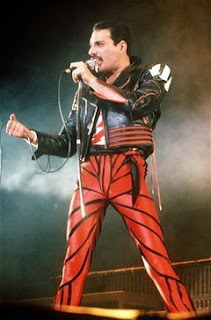 Mercury, being of Indian descent, has been known as the very first successful rocker from Asia. Now, if this gig pushes through w/ Queen, this will be a big break for Adam, and revive the recording career of the almighty rock band. Click here for the story. Check out Adam (and whatshisface) performing with Queen during the finale show of AI, and tell me who's got the best pipes. Here's Adam on Fox and Friends the morning after the finale. He really is a swell kid. He has his feet on the ground and seemed genuinely happy at the results. Anyhoo, he knows he's a star. He also confirms the ongoing talks with Queen. I'm so glued to the news on this kid. He's going places!